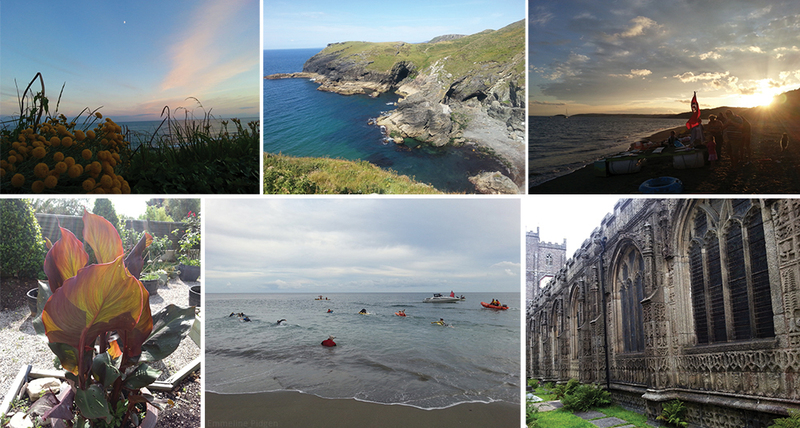 So this summer I decided to go back to my homestead and stay with my family in Cornwall for a few months. Sometimes a change of pace and scenery is exactly the remedy to kick-start your inspiration and motivation, especially just after finishing a big book project. Cornwall holds a big piece of my heart, and being able to spend most of my days by the roaring sea, or at least outside rather than basking in computer glow was refreshing. I continued to work whilst I was staying South, but allowed myself time out to explore and adventure. I visited a lot of castles and cliff faces, and indulged in just watching the mood of the sky and sea change and shift. Cornwall's fantastic for that connection to heritage and wild nature, and that's been really inspiring a graphic novel I've started work on, as well as a new picture book story. A lot of these photos were quick snapshots of things which sparked ideas, or had the potential to be useful as reference or to re-visit for inspiration in the future. That ancient, engraved church wall in Launceston was beautiful, the scene of multi-coloured swimmers racing into the sea was unusual, and the colours and patterns in those leaves burst out. It's a collection of pre-ideas and captured shards of inspiration. Often it seems like taking time out is wasted time when you're freelance. I know I personally find it hard to switch off from work-mode a lot (in fact, it's 22:30 now and I really shouldn't be working! ), but to generate great ideas your mind needs some space. Going for a walk or a little adventure is perfect for riling up that inspiration - it's not slacking off, it's feeding your creativity. Allow yourself some time off, freelancers!